Far away, you can distinguish the sea. What I like here is that it does not look like a kind of summer resort with a beach, restaurants, cafés, and a holiday feeling. It seems more like a day to day life, an active city… with the sea as a bonus. This is a private alley, not a through passage, which makes it even more strange. But what did attract me here was the electric wires and the wooden pole. It reminds me of Japan. In fact this is not very common in France. Most of the time one doesn't notice these electrical lines. Here they seem to irradiate from the center. 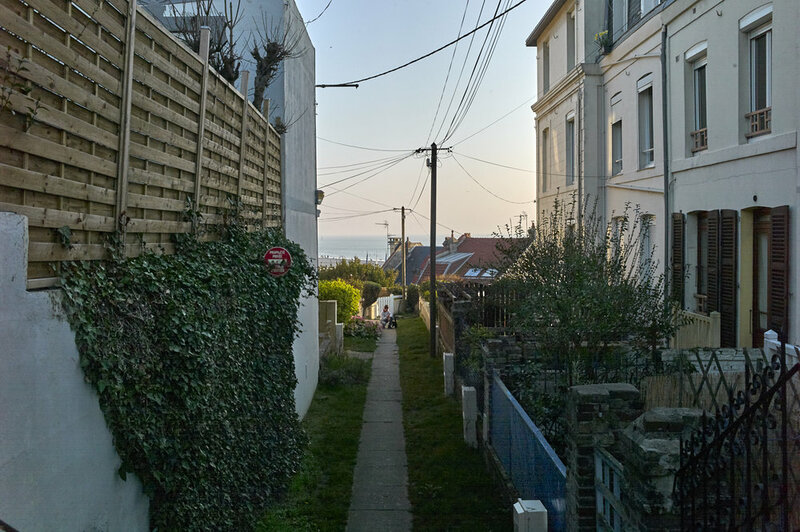 This very narrow place seems intimate with the little gardens in front of the houses.